The Kings Centre is ​currently based at St John’s Church in Southall. The project will redevelop the old St John’s Church building on King Street into a new centre, surrounded by landscaped open space. As a result of this exciting regeneration, a neglected site on a busy high street in the heart of Old Southall will be transformed into a community facility that is open and accessible to all. 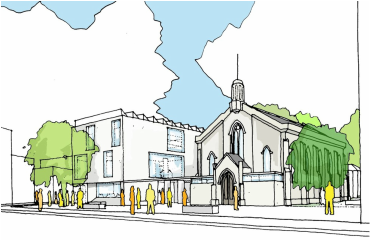 The site will incorporate a renewed church building housing a multi-use auditorium and teaching area, a new 2-storey community building, a redeveloped garden as quiet space in the midst of Old Southall and a renewed public space suitable for adaptation for public use and festivals. For more information, to see the plans, or to explore how you could partner with the Kings Centre in this redevelopment, please contact us.